Below are a list of commonly asked questions and the answers. If you have other questions, please feel free to contact us on the form below. Which class(es) should I take? How long will I have access to the online classes? You will have 3 months of unlimited access to the class(es) you are registered for. Please note that the you will have access to the breastfeeding class for 1 full year. Most people are able to watch classes without any issues. If you do run into any problems, however, we try to handle them immediately. The video is streaming, so if you have a data plan that caps out, this will deplete your data very quickly. Can I share my classes? Classes are intended for the pregnant couple that purchased the class. If you have a sister, mom, or best friend that will be attending your birth, they are invited to watch Class 6, Supporting Arms, with you. It will give you the opportunity to discuss various things about your labor and birth that you might not have otherwise. If there are too many IP addresses used on one account, you will get locked out and will need to email our Admin to get back in. If you choose to purchase a class workbook, please allow 1-2 business days for this to be mailed to you. I do not live in the United States? Can I still take Birth Boot Camp online classes? Do I have to pay extra shipping? As long as you can stream video, you can take Birth Boot Camp online classes. If you choose to purchase a class workbook, there is no extra charge to ship out of the United States. If you decided to purchase the printed workbook, it will be mailed to you. My Flexible Spending Account covers childbirth education classes. Can I pay with my card? Unfortunately, we cannot accept your FSA card, but you will receive a receipt with your materials. You should be able to turn in your receipt for reimbursement. Who teaches the online classes? Donna Ryan, the founder of Birth Boot Camp, teaches the classes with Sarah Clark, co-curriculum-writer and instructor trainer. Classes are laid out morning-talk-show style, and they are interesting and interactive. Donna and Sarah have known each other for many years, even before becoming childbirth educators. Their chemistry is obvious, as they have been told at instructor trainings, watching them teach is like watching a morning talk show. When they recently re-recorded the Birth Boot Camp classes, they decided to run with what already comes so naturally. Donna Ryan is available to answer your questions. She considers herself your childbirth educator and is here to answer your questions just as if you were in her live class. You can reach her by emailing contact@birthbootcamp.com. How can I get the most out of online classes? Treating your online classes as you would a live class is the best bit of advice. Pick a class night, put it in your calendar, then do the homework (relaxation, Chow Charts, exercises, discussions with each other and/or care provider, etc.) during the week. Don’t try to cram the classes all at once, even if you are getting a late start. Space them out by at least a few days and work on the weekly assignments even if it’s not for an entire week. Be accountable to each other. Other useful tips can be found once you log on after registration. 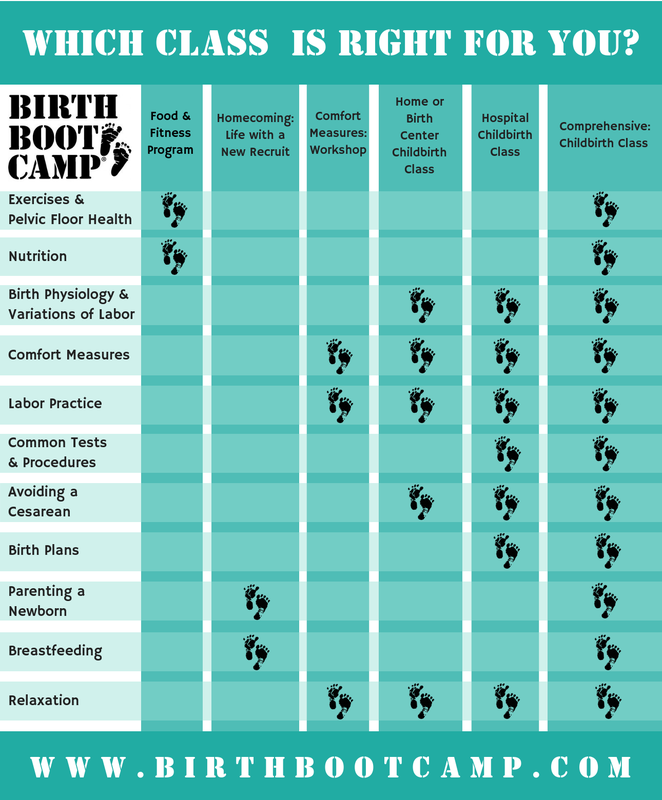 What is the format of the Birth Boot Camp online classes? The first thing you will watch is the actual class. Periodically, you might stop the video and have a short discussion with one another. At some point during the class, you may pause the class video, scroll down to the birth video, and then come back to the class for more discussion. Each week also includes exercises, relaxation downloads, and a comfort measure to practice. The relaxation exercises are also written in the Field Manual so you can practice them together.